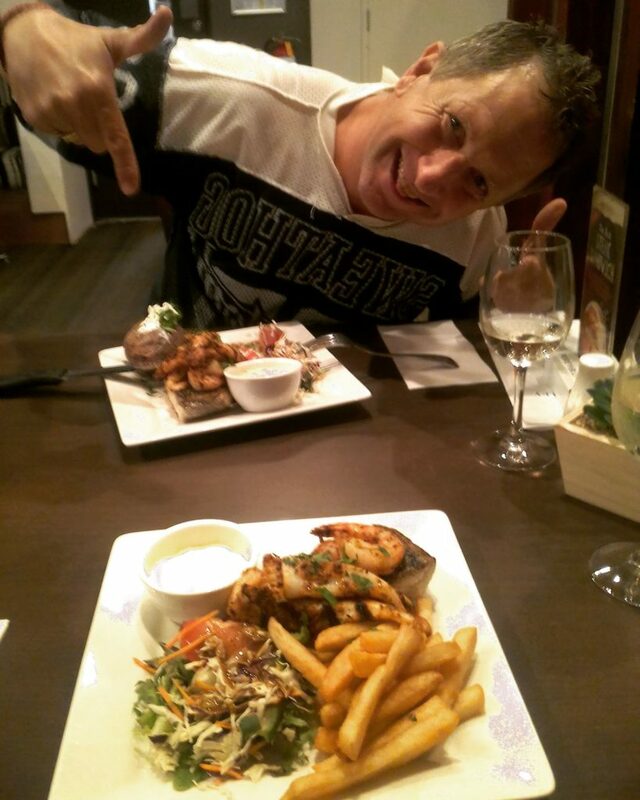 So began the quest to discover something that he could eat that would fit in with his diet (no bread, flour, sugar, pasta, rice, chips etc)… his first night here we ended up going to the local pub for dinner where we both ended up getting the seafood platter that was on special (chips on mine, baked potato on his plate). Lord Stanley Hotel – not bad for a pub dinner! The real challenge hit us when we were out shopping… we had checked out soooo many places at Garden City… I also made the mistake of introducing him to 8 Street – the Asian street food courtyard inside Westfield Garden City… we quite literally lapped that place so many times I can almost tell you the menu for each eatery there! We ended up back outside for the second (or possibly third) time, but finally able to decide on just the right place for Anthony to eat at. Kinn Thai – “Kinn” actually means ‘eat’ and they add their own flair to the menu of traditional Thai dishes they serve. Whilst it took a little while to get our meals, the portion sizes are rather generous and well worth the wait. The meals are affordable and they cater for vegan, vegetarians and gluten free diets as well. 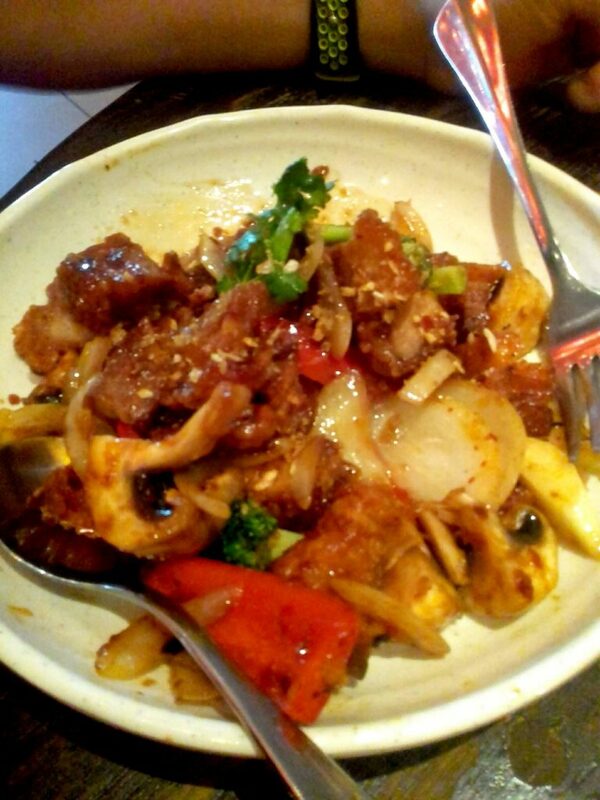 Anthony ordered the Chilli Jam Crispy Pork – stir fried crispy pork with chilli jam and vegetables – by the way he wolfed that down, I’d have to say it must have been pretty damn good, and for only $22 not bad for the generous serving size he received. I think Anthony’s indecision rubbed off on me as it took me a bit to decide what to get for dinner myself. 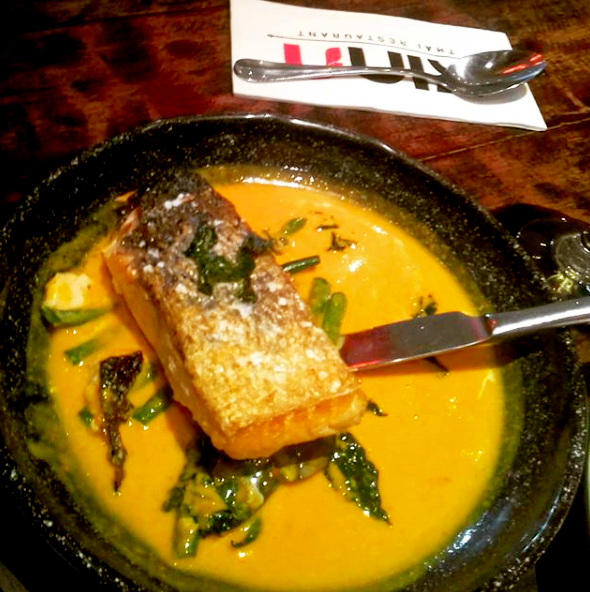 It was either that or the fact that there were so many great dishes to choose from – I kept switching between choices before finally settling on the Salmon Curry! I’m glad I did – it was beautifully cooked and the curry had just the right amount of kick to it (made all the more noticeable as I opted not to have rice). At only $26 for the curry, it’s another dish worth its price as the aromas, the taste and the serving size were all perfect. 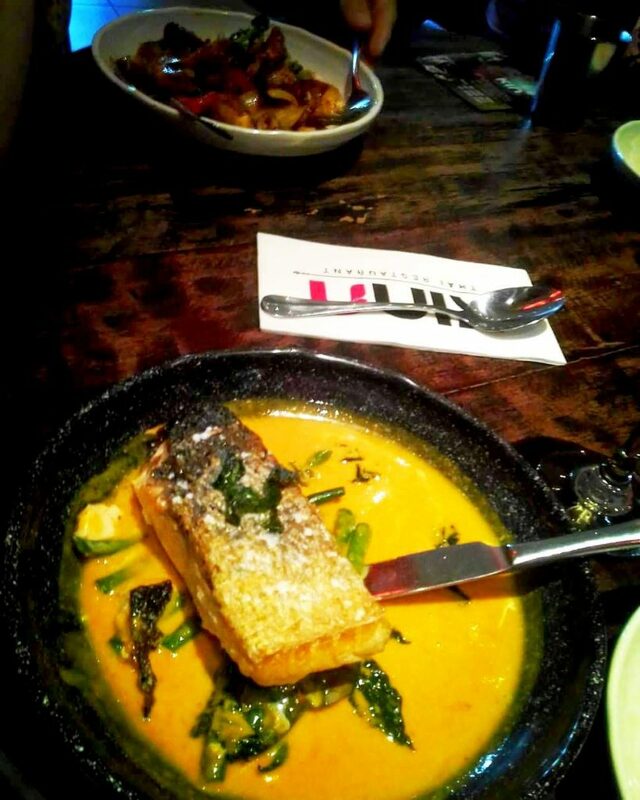 If you’ve never tried Kinn Thai before, I can highly recommend them. The prices are fairly respectable, the portion sizes very generous, and the staff were friendly as well. The food was absolutely delicious and I’m looking forward to trying something different there next time I go back.